Stars and the country's most stylish spent a night of fashion nostalgia in a ball hosted by our sister mag Preview. See the the best dressed of 'em all. If you attended Cosmo Club Scene at 7th High in Bonifacio High Street or you've gone on a gimmick or two with your friends there, you would barely recognize the place when you see the party photos in this gallery. You'd think you're seeing pictures of high fashion people partying in Coco Banana, our country's version of Studio 54, back in the era of disco. But, our sister magazine Preview made the spirit of retro party (and fashion) live on in their super star-studded annual event, the Preview Best Dressed Ball, held at 7th High last July 8. Preview took the fashion crowd back to the '70s for the second of two back-to-back parties they hosted (the first was the Topshop 10th Anniversary Party in Opus, Resorts World). Groovy fashionistas and celebrities dug out their bell-bottoms, platform shoes, and psychedelic dresses for the Twitter-trending party, hosted for their Best Dressed List, boogie style! Leading the list of this year's best dressed women is cover girl and actress Iza Calzado. Actress Mylene Dizon, Apple and Eve creative director Penny Ngu, jeweler Lucille Dizon, designers Camille Co and Charina Sarte, clothing retailer Keri Zamora, Havaianas' Anne Gonzales, model Pauline Prieto, and Break My Style's Laureen Uy round up this year's cream of the stylish crop. Loads of celebrities and your local fashion icons who came to support Preview and their stylish peers turned into disco divas upon hearing funky tunes like "YMCA," "Do the Hustle," and other hit disco songs. Spotted among the retro-clad crowd were Cosmo cover girls Anne Curtis, Andi Eigenmann, Angel Locsin, and Bianca Gonzalez; Fun Fearless Female Awardee Cristalle Belo Henares; Azkals' James Younghusband; and Best Dressed of the Night, Isabelle Daza, among so many others. 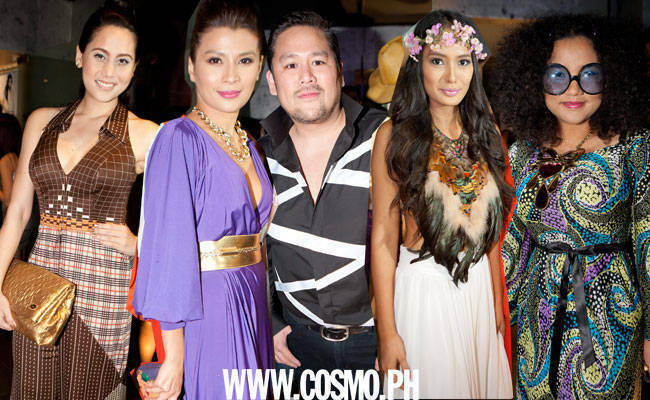 See the fab celebrities, stylistas, and editors at the stylish shindig when you view the gallery!